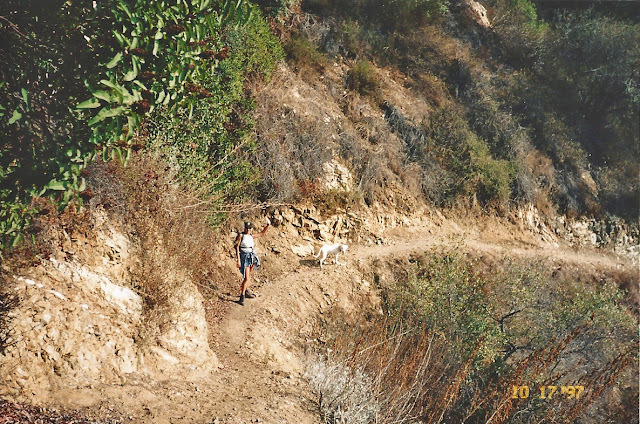 This trail originates in Monrovia Canyon Park on Sawpit Canyon Road and traverses about 1.3 miles of paved/dirt road before reaching the actual trailhead. 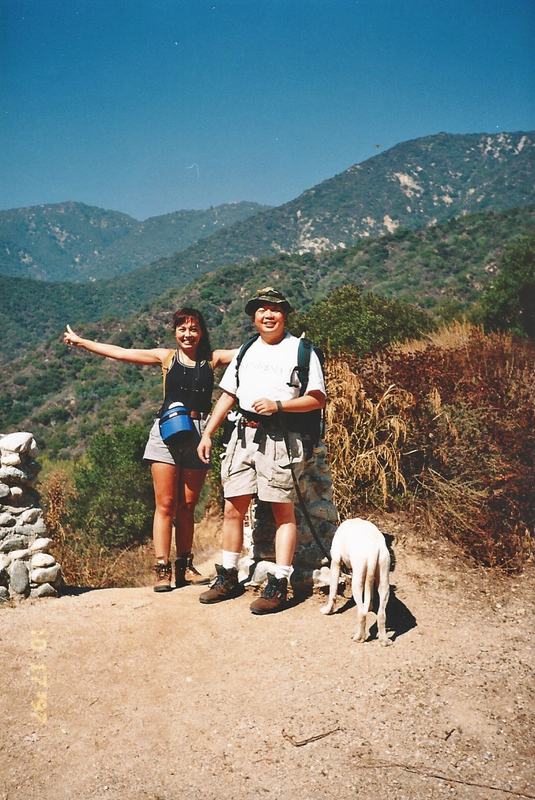 The trail winds about 3.5 miles through scenic Sawpit, Sycamore, and Twin Springs Canyons. The last intersection is with Deer Park Trail, leading to the ruins of Deer Park Lodge, a popular vacation retreat run by Ben Overturff and his wife in the early 20th century. 10/18/97 Elaine, Gil & Rusty. Ben Overturff Trail. 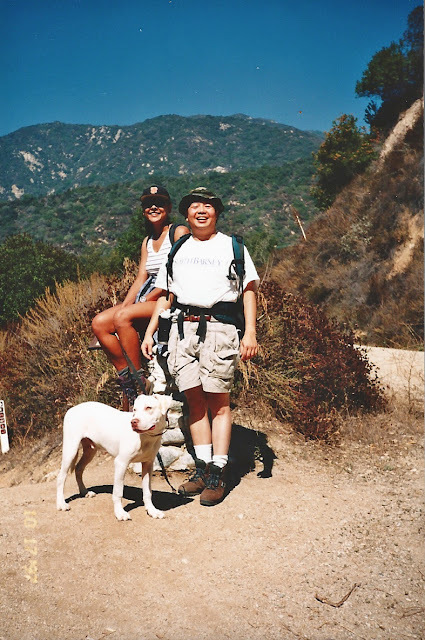 10/18/97 Me, Gil & Rusty. 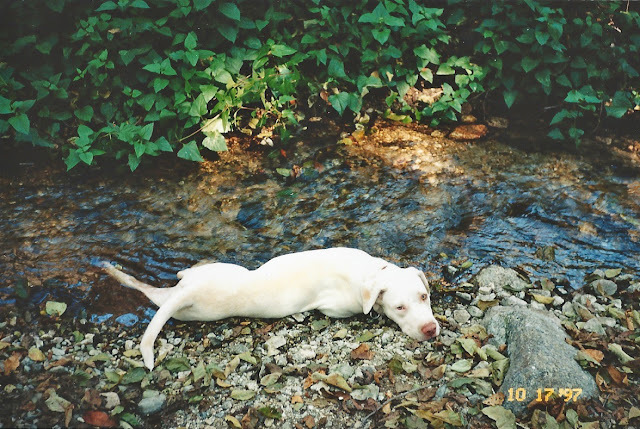 10/18/97 Rusty, cooling off in the creek. 10/18/97 Elaine, Gil & Rusty. 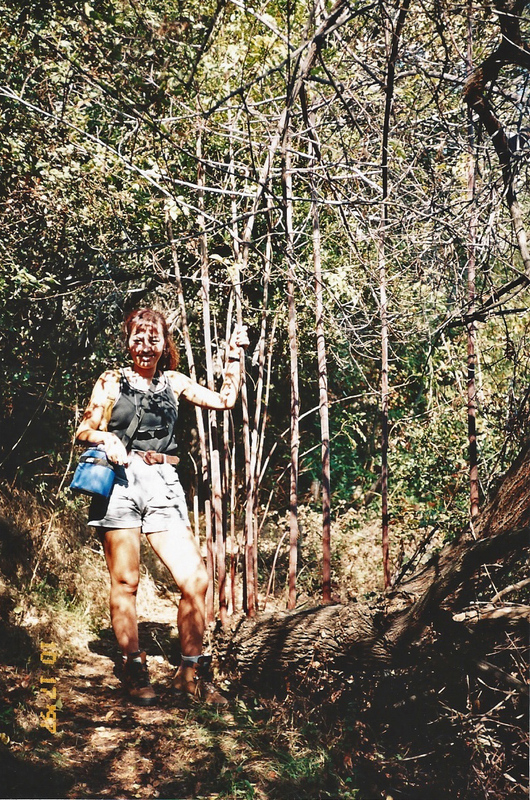 10/18/97 Parts of the trail are nicely shaded by the canopy of live oaks and dense chaparral. 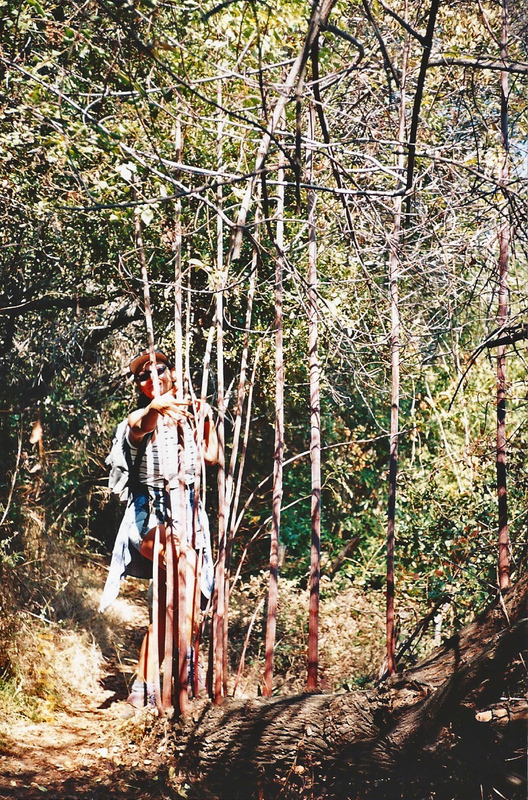 10/18/97 Elaine, the serial tree hugger. (knowing him, probably poison oak). 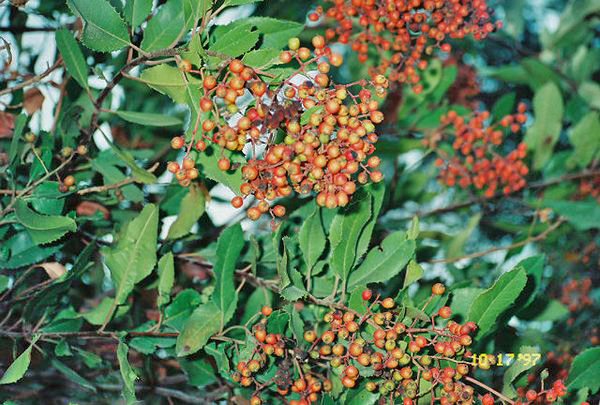 10/18/97 Toyon (Heteromeles arbutifolia). 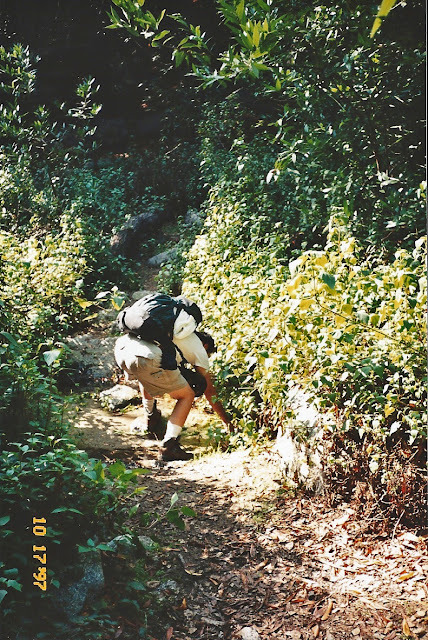 Ben Overturff Trail. Directions: Exit Myrtle Avenue on the 210 Freeway in Monrovia and go north about 2 miles (through old town Monrovia) to Foothill Blvd. and turn right. Go two stoplights to Canyon Blvd. and turn left. Drive through a residential area for about a mile, keeping right, then turn right into Canyon Park at the monument sign. 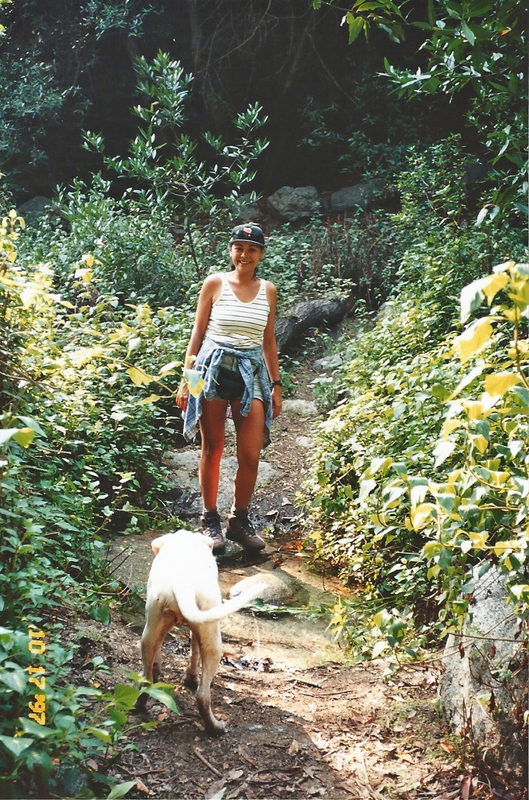 The park entry is about a half mile ahead. Hours: Park hours are 8am to 5pm (the lower main gate closes at 5pm). Closed on Tuesdays, Christmas day and 4th of July weekend. Fees: $5.00 vehicle entry fee. Forest Adventure Pass not applicable here. Pets: Dogs are allowed on the trails, leashed. Trail: The Ben Overturff Trail is about 7 miles round trip with a 2,000 ft. elevation gain. 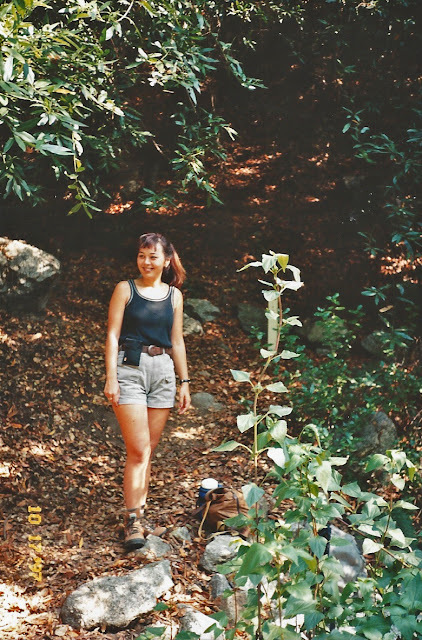 Hiking time will be 3-5 hours.